August is “American Artist Appreciation Month,” so I’m rolling out some artists you may never have thought about, or seen for that matter. The breadth of the body of work of Jim Drain is astounding. You have to marvel at the joy with which he uses color! 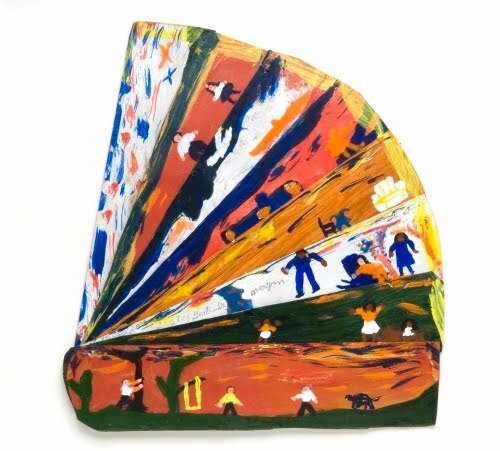 The range of his artwork—from installations to paintings and sculpture to fiber arts—is perhaps explained by his background studying at the Rhode Island School of Design in the late 1990s. While living in a factory building in Providence populated by artists, he was part of a group of cartoonists, printmakers, painters, and musicians who held shows in the building, called Fort Thunder. He also formed the art/performance/music collective Forcefield, which collaborated on videos, comics, totems, costumes, kinetic sculptures, and experimental electronic music. After graduation, he gravitated toward fiber arts—specifically knitting, which he had learned from his grandmother—which gave him an interest in discarded materials. 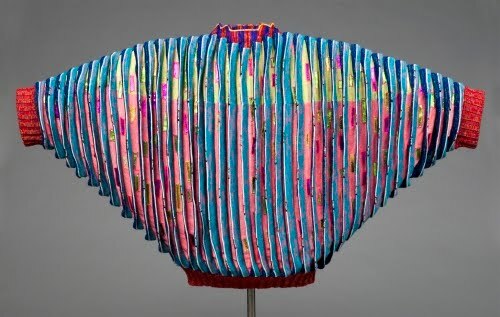 His wearable art is the culmination of this interest in fiber art. 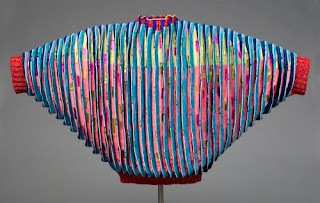 Not surprisingly with a BFA in sculpture from RISD (1998), his sweaters, extensions of his anthropomorphic sculptures, are exhibited with sculptures that echo the pleats. In his collaboration with Philadelphia’s Fabric Workshop, he produced beautiful sculptural sweaters for the Opening Ceremony store. Drain created two prototypes of knitted sweaters with the Fabric Workshop that were sculptural in form. He used every fabric possible to embellish these sweaters, which included beading along the many folds. Drain’s sweaters are knitted with wool from a company in Maine. Born in Cleveland, Drain now lives and works in Miami. He considers knitting to be like painting, because the artist never knows how the materials and colors will eventually work out together. The visionary art of Sister Gertrude Morgan reflected in this church fan is a perfect complement to Drain’s pleated sweater. As a self-taught artist, her inherent sense of color balance enlivens her painted works. Her artwork most often records visions she experienced or passages from the Bible. She instinctively understood how different strong colors reflected mood or ideas such as hope, humility, and optimism. As an artist, Morgan’s art came from her spiritual life—a means of expressing her faith. Born in Alabama, she moved to New Orleans in 1937 to become a street preacher. It was there that she established a storefront church in 1939. This church also contained a day care center and an orphanage. When she established the Everlasting Gospel Ministry house in the Lower Ninth Ward in 1956, it was there that she began painting in earnest. Morgan’s fans were handed out to friends and people who visited the Prayer Room of her ministry. Many of her other painted works were given away to congregants, and many others were sold from the E. Lorenz Borenstein Gallery in the French Quarter. Although her focus was always on her ministry, Borenstein was Morgan’s connection to the wider art world, including Lee Friedlander and Noel Rockmore. Although her art sales supported her spiritual work, she stopped painting in 1973 to concentrate on her ministry. Check back throughout the month of August as I feature more amazing American artists.